One example of great design for me is the Strida Foldable Bike. It is elegant, very user friendly, and insanely useful. You can fold it and easily take it with you in the subway, bus, car or even motorcycle. It is a great solution for everyday commuting. I use it everyday. An artefact that lets me store my Ukulele in a safe and convenient manner. A system which I can deploy to keep my room organised without sacrificing being able to quickly find my things around. A way to prevent getting so wet when biking around on rainy days. The artefact should be lightweight and easily storable so I can take it with me on my small Strida foldable bike. Dual-usage shoes for biking, meaning they could transform from sandals (bike friendly) to more formal shoes. A better way to place my TV without sacrificing the flexibility of easily adjusting my viewing angle and without taking as much space. The cabling on my sound system is a mess! Tangled cables everywhere, they are messy, ugly and not very safe. I would love a way to make them tidier and better placed. I have four bicycles and a motorcycle in my garage which has very limited space. I would love a way to better store the bicycles and also provide a way to store tools and spare parts. I have a 4 year old website which documented my bicycle trips around the world. It is a bit old and not up-to-date with the latest web technologies. I would like to redesign my website using new best technology and design best-practices. 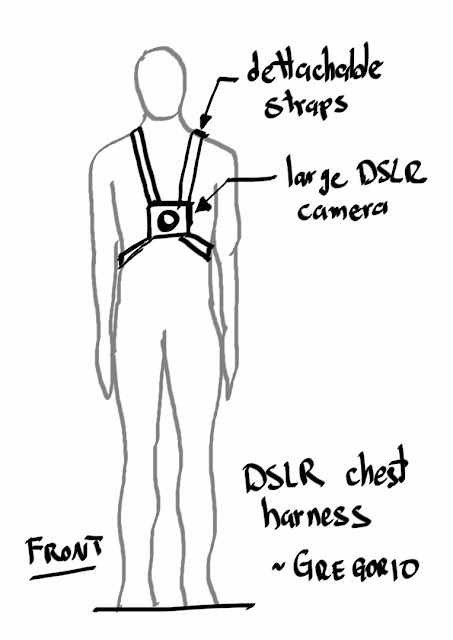 I am a bit of DSLR (digital photography on Micro 4/3s) geek, so I would like to have an artefact like a strap or harness that goes in my chest and provides a way to take pictures and videos with my DSLR camera while riding a bike. 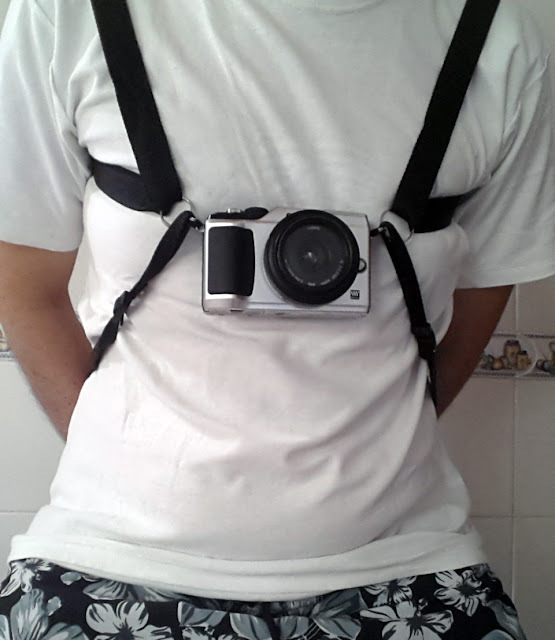 Think kind of a DIY GoPro for larger DSLR cameras. A better stand for drawing and sketching with my tablet while standing/sitting on a stool. 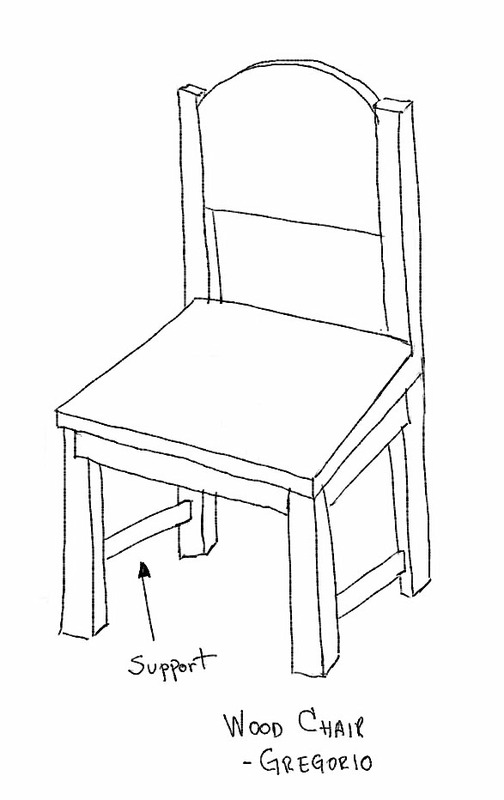 Here is a simple sketch of a wooden chair. I am a bit of DSLR (digital photography on Micro 4/3s) geek, so I would like to have an artefact like a strap or harness that goes in my chest and provides a way to take pictures and videos with my DSLR camera while riding a bike. Here you will find a photograph of my first prototype. As you can notice, the prototype is very rough and needs a lot of improvement, hopefully I will work it out during the course.